ANOTHER whale washed ashore on Davao City’s coast and later died. This time, it was believed to have been a victim of dynamite fishing. 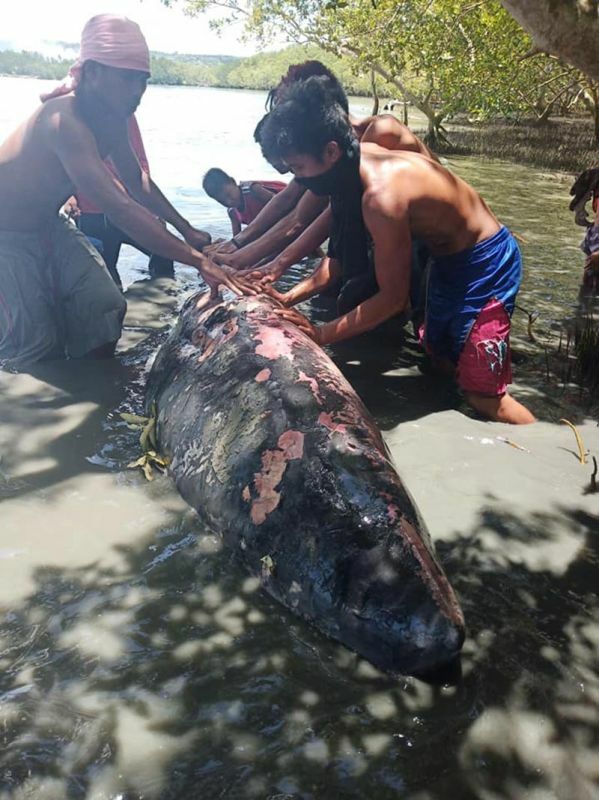 Darrell Blatchley, director of the D'Bone Collector Museum, said in an interview with SunStar Davao, said a female Pygmy Sperm Whale was found floating along the coastline of Calderon Seaside Kilometer 22, Bucana, Bunawan District, Davao City. The residents told him that the whale had been alive when it was discovered on Saturday, but it died on Sunday. Upon conducting a necropsy on the whale, which measured 10.4 feet, Blatchley said he found no food inside the animal’s stomach which means that the whale had not gone hunting because it may have lost its sonar or echolocation. “One fishing hook and line but nothing inside stomach so possible dynamite fishing casualty,” he said. In just two weeks, two whales have been recorded dead in Davao. This brings to four the number of marine animals that died in Davao in the last three months. “Dynamite fishing is a blast percussion that stuns small fishes. It also destroys the reef. It causes whales and dolphins to lose their echolocation and thus inability to hunt and navigate. Just one possible way this one died,” Blatchley said. He said Davao Gulf is an environmental hotspot, thus, it needs to be protected. Eighteen species of whales and dolphins migrate through the gulf. Although most of the whales found here died due to plastic ingestion in the last six years, he also said that five marine mammals died due to dynamite fishing. He thanked the Bureau of Fisheries and Aquatic Resources (BFAR) and the local Muslim fishing community for their help in the recovery and loading of the whale. Blatchley removed 99 percent of the meat Sunday and buried this. He is now processing the skeleton for display at the museum.